How did people live back in the ‘olden days’? What were the times like? These memoirs flow over with eight decades worth of country life in the rural parts of Hesse, skilfully told with a sense of humour and dry wit. 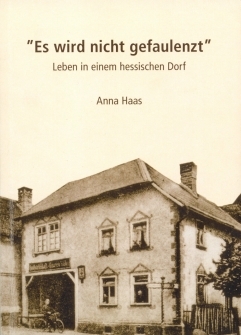 The author, the octogenarian Anna Haas, spent her youth living with her extended family, with lots of relatives in the nearby countryside. Lending a hand on the farm and helping out in the family-run business made as much a part of her early life as spending time listening to the stories told by her parents, grandparents, relatives and friends. These times did not know yet what a radio or TV was, or indeed what it feels to be bored. In turn, our generation may now listen to the author’s story, thanks to her efforts in recording everyday life from an earlier time. Personal events, such as baptism, the first day of school, weddings and births are recalled as well as German history in general. The era of the III. Reich and the pity and suffering of the years during and after World War II play as much a part here as the peaceful and quiet times of the 50s and 60s, when Germany experienced a great economic and cultural rebirth. With a lot of local flavour, the author tells of family matters, recounts the day-to-day life and – almost in passing – gives the reader a vivid impression of nearly a century of German history. Thanks to the efforts of daughter and granddaughter, sorting through the manuscripts, helping out with design ideas and generally providing a lot of advice and support, this book is the result of three generations coming together. Beautifully illustrated with numerous personal photos of the era, this work makes it possible to, at least for a while, partake in a very eventful life.